Sometimes it feels like kids run the home. There’s no getting around the fact that they need space to run, they eat a lot, and they play a lot. So when it comes to renovating or updating your home, you must keep the kids in mind. This counts for every room in the house, especially heavy-use areas like the bathroom. Most experts will warn against simply installing smaller sinks, countertops, or toilets. The bathroom needs to be used by adults, too, so focus on childproofing your bathroom design options instead. Having multiple sinks gives you added flexibility. If you have more than one kiddo using the restroom, the two sinks let them get ready for bed simultaneously. If the adults are sharing the bathroom, you can designate one sink for the kids and one for Mom and Dad. Letting the kids have their own sink gives them a place for their toothbrushes, toothpaste, cups, combs, and more. 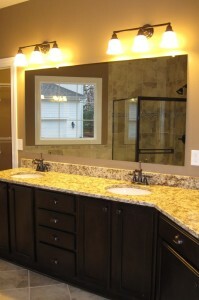 Bonus: double sinks are attractive to any future home-buyers. It’s easier to install equipment that’s not permanent. This lets you adapt the bathroom to adults when needed. For instance, removable showerheads with adjustable flow let you set it for any height and adjust the stream to be most comfortable for the young ones. Kids may not have as many toiletries as adults, but you can still impart a sense of ownership by giving them space. Designate drawers or closet shelves for their toothbrushes, towels, toys, or soap. Choose sinks or cabinets with multiple drawers, so you can assign a drawer for each child, or install cubbies with little tubs for each of them. Bonus: giving them storage space keeps their stuff from cluttering surfaces. Rather than building in steps or installing a lower sink – permanent changes you may be replacing in the future – use different equipment to give children access. For instance, instead of installing a second mirror just for kids, choose a taller mirror that reaches the floor. Rather than purchasing easy-access tubs, use small step stairs (with non-slip surfaces) to help the kids enter and exit at bath time. The true kid-friendly bathroom includes lots of color, but this doesn’t mean you have to commit to permanent tile colors or sink features. Introduce color through paint, bright posters, shower curtains, unique mirrors, or vinyl decorations that stick to the walls. All of the above options will give the kids ownership of their space, and help them develop good hygiene habits. Using double sinks, assigning storage, employing adjustable equipment, and using decorations to add a splash of color – all of these things will make your new or renovated bathroom kid-friendly.